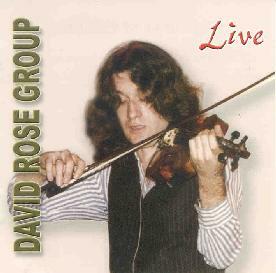 David Rose Group - "Live"
David Rose was, during most of the 70s, the violinist for Transit Express, one of France’s best and most durable jazz-rock outfits. The group was notable for its extensive use of synthesizers and electronics in a fusion context (similar to the Mahavishnu Orchestra) and reached its peak with the brilliant 1977 release Couleurs Naturelles, a luminous exposition of the possibilities of European jazz-fusion welded to a neo-classical sensibility. In retrospect, Transit Express had as much in common with King Crimson and Genesis as they did with any number of jazz-rock groups. Rose released several solo LPs in the late 70s (the most notable being The Distance Between Dreams) and this live recording dates from approximately the same time period. Rose himself thoroughly dominates most of the pieces on Live, alternating acoustic and electric violin, the latter often heavily processed with echoplex, distortion, and other sundry devices. But the rest of the group have plenty room to show off their impressive chops, particularly Serge Perathoner who plays Jan Hammer to Rose’s Jean-Luc Ponty throughout most of the lengthier pieces. The analogy is certainly apt, as much of Live could be easily mistaken for lost tracks from any number of mid to late 70s Ponty albums, particularly Imaginary Voyage or Cosmic Messenger. Lots of fusion fire between Rose and his compatriots, especially on “Au Dela du Miroir” and “Skyway,” both of which are strongly reminiscent of King Crimson circa Larks’ Tongues in Aspic. Superb musicianship and flawless technique are complimented by dead-on improvisational instincts throughout the entire performance. Definitely a diamond in the rough for Francophiles and fusion freaks.